Categories: Climate Change/Emergency, Current Articles, Ecology Articles | Permalink. Now, in the early years of a new millenium, we find ourselves in the midst of another renaissance — a pivotal inflection point in the history of civilization. This time, however, the belief system we need to overcome is the idea that perpetual economic growth is the key to prosperity — or even possible. That’s why I found myself especially fired up by the interview we just published with Hunter Lovins about her new book, A Finer Future, and the in-depth paper it references, by John Fullerton, on Regenerative Capitalism. Specifically, the compelling case they make that regenerative businesses are more successful businesses, and that we’re ultimately headed in the right direction, albeit not as quickly as we need. The idea of business as a force that regenerates rather than degenerates ecological and human systems is by no means a new one. Visionaries like Ray Anderson, Carol Sanford, Bill Reed and many, many others have been championing, and implementing, it for decades — including Hunter Lovins (a la Natural Capitalism, circa 1999). Lovins recounts in the interview her experience sitting with Anderson back in 2001, at which time his bold vision — to redesign Interface’s core business to eliminate any negative impact on the environment by 2020 — was unprecedented, even outlandish. Even then, however, it was as much about building a better company as it was about social and environmental responsibility. “Everything I’m doing to make Interface a more sustainable company is enhancing shareholder value,” Anderson told Lovins, at the time. Case in point: Companies that lead in measuring and managing their carbon footprint have an 18 percent higher return on investment than the laggards, and a 67 percent higher return than companies that performed as if climate were not a material issue, according to a 2014 study conducted by CDP. The rapid adoption of Environmental and Social Governance (ESG) Criteria now has evidence to back it up, too — publications ranging from Bloomberg to GreenBiz are all telling the data-driven story of why ESG is good for business, in addition to people and the planet. There’s even a new ETHO Climate Leadership Index, which has proven the climate-smart companies in which it invests consistently outperform others in the S&P 500. As Fullerton poignantly put it, “We are the new Copernicans.” So, let’s get back to work. Sponsored: ScottMadden discusses the building blocks of a successful corporate renewable energy strategy. CMS Enterprises works with developers to own and operate wind, solar and energy storage projects. We bring custom renewable energy projects to life for corporate, industrial, municipal and institutional customers. We offer a wide range of energy products and services under one roof, including an in-house energy marketing group to power projects anywhere in the U.S. For more, visit CMS-Enterprises.com. After years of difficult times, it’s a great time to be an energy entrepreneur, says a group of energy tech leaders at Stanford’s energy event last week. 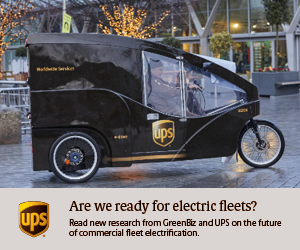 Here’s how we can fast-track electric vehicles across industry. From supply chain to waste management, cities are trying to develop local circular economies. The ridehailing giant has met regulatory barriers in some cities. Can converting its cars to EVs push past them? Plus, a conversation with GreenBiz emerging leader Alexis Cureton, an advocate of electric vehicles. How Comprehensive is Your Building Energy Management Strategy? Your current strategy may include initiatives to consume less, spend the right amount on purchasing, and produce on-site. But it’s worth asking – are there opportunities for improvement? If so, where? The Siemens Total Energy Management approach is a new way of thinking. Click here to learn more. Categories: Clean Renewable Energy, Climate Change/Emergency, Current Articles | Permalink. The Millennium Ecosystem Assessment of 2005 concluded that changes to ecosystems due to human activities were more rapid in the past 50 years than at any time in human history, increasing the risks of abrupt and irreversible changes. The main drivers of change are the demand for food, water, and natural resources, causing severe biodiversity loss and leading to changes in ecosystem services. These drivers are either steady, showing no evidence of declining over time, or are increasing in intensity. The current high rates of ecosystem damage and extinction can be slowed by efforts to protect the integrity of living systems (the biosphere), enhancing habitat, and improving connectivity between ecosystems while maintaining the high agricultural productivity that humanity needs. Further research is underway to improve the availability of reliable data for use as the ‘control variables’ for this boundary. Recent evidence suggests that the Earth, now passing 390 ppmv CO2 in the atmosphere, has already transgressed the planetary boundary and is approaching several Earth system thresholds. We have reached a point at which the loss of summer polar sea-ice is almost certainly irreversible. This is one example of a well-defined threshold above which rapid physical feedback mechanisms can drive the Earth system into a much warmer state with sea levels metres higher than present. The weakening or reversal of terrestrial carbon sinks, for example through the on-going destruction of the world’s rainforests, is another potential tipping point, where climate-carbon cycle feedbacks accelerate Earth’s warming and intensify the climate impacts. A major question is how long we can remain over this boundary before large, irreversible changes become unavoidable. Around a quarter of the CO2 that humanity emits into the atmosphere is ultimately dissolved in the oceans. Here it forms carbonic acid, altering ocean chemistry and decreasing the pH of the surface water. This increased acidity reduces the amount of available carbonate ions, an essential ‘building block’ used by many marine species for shell and skeleton formation. Beyond a threshold concentration, this rising acidity makes it hard for organisms such as corals and some shellfish and plankton species to grow and survive. 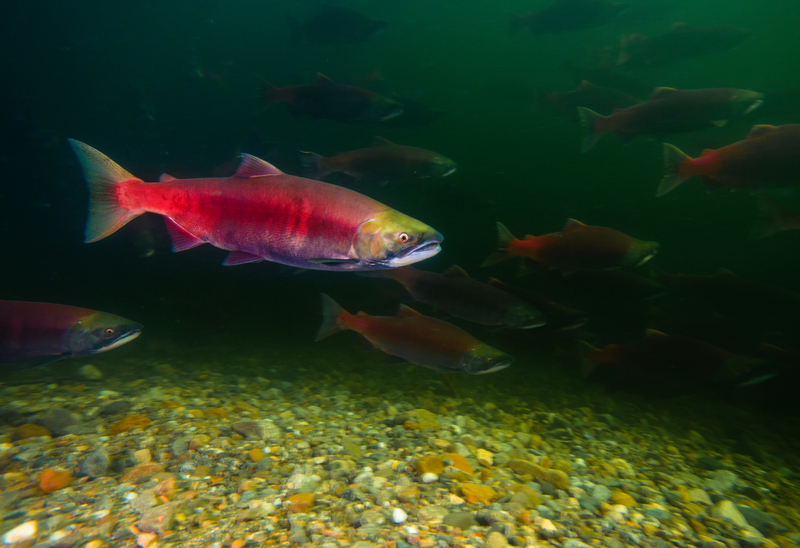 Losses of these species would change the structure and dynamics of ocean ecosystems and could potentially lead to drastic reductions in fish stocks. Compared to pre-industrial times, surface ocean acidity has already increased by 30 percent. Unlike most other human impacts on the marine environment, which are often local in scale, the ocean acidification boundary has ramifications for the whole planet. It is also an example of how tightly interconnected the boundaries are, since atmospheric CO2 concentration is the underlying controlling variable for both the climate and the ocean acidification boundaries, although they are defined in terms of different Earth system thresholds. The freshwater cycle is strongly affected by climate change and its boundary is closely linked to the climate boundary, yet human pressure is now the dominant driving force determining the functioning and distribution of global freshwater systems. The consequences of human modification of water bodies include both global-scale river flow changes and shifts in vapour flows arising from land use change. These shifts in the hydrological system can be abrupt and irreversible. Water is becoming increasingly scarce – by 2050 about half a billion people are likely to be subject to water-stress, increasing the pressure to intervene in water systems. A water boundary related to consumptive freshwater use and environmental flow requirements has been proposed to maintain the overall resilience of the Earth system and to avoid the risk of ‘cascading’ local and regional thresholds. The biogeochemical cycles of nitrogen and phosphorus have been radically changed by humans as a result of many industrial and agricultural processes. Nitrogen and phosphorus are both essential elements for plant growth, so fertilizer production and application is the main concern. Human activities now convert more atmospheric nitrogen into reactive forms than all of the Earth’s terrestrial processes combined. Much of this new reactive nitrogen is emitted to the atmosphere in various forms rather than taken up by crops. When it is rained out, it pollutes waterways and coastal zones or accumulates in the terrestrial biosphere. Similarly, a relatively small proportion of phosphorus fertilizers applied to food production systems is taken up by plants; much of the phosphorus mobilized by humans also ends up in aquatic systems. These can become oxygen-starved as bacteria consume the blooms of algae that grow in response to the high nutrient supply. A significant fraction of the applied nitrogen and phosphorus makes its way to the sea, and can push marine and aquatic systems across ecological thresholds of their own. One regional-scale example of this effect is the decline in the shrimp catch in the Gulf of Mexico’s ‘dead zone’ caused by fertilizer transported in rivers from the US Midwest. An atmospheric aerosol planetary boundary was proposed primarily because of the influence of aerosols on Earth’s climate system. Through their interaction with water vapour, aerosols play a critically important role in the hydrological cycle affecting cloud formation and global-scale and regional patterns of atmospheric circulation, such as the monsoon systems in tropical regions. They also have a direct effect on climate, by changing how much solar radiation is reflected or absorbed in the atmosphere. Humans change the aerosol loading by emitting atmospheric pollution (many pollutant gases condense into droplets and particles), and also through land-use change that increases the release of dust and smoke into the air. Shifts in climate regimes and monsoon systems have already been seen in highly polluted environments, giving a quantifiable regional measure for an aerosol boundary. A further reason for an aerosol boundary is that aerosols have adverse effects on many living organisms. Inhaling highly polluted air causes roughly 800,000 people to die prematurely each year. The toxicological and ecological effects of aerosols may thus relate to other Earth system thresholds. However, the behaviour of aerosols in the atmosphere is extremely complex, depending on their chemical composition and their geographical location and height in the atmosphere. While many relationships between aerosols, climate and ecosystems are well established, many causal links are yet to be determined. More than 1,000 UK climate activists launched a massive civil disobedience campaign Wednesday when they blocked several roads near London’s Parliament Square, The Guardian reported. The newly formed group Extinction Rebellion seeks to push the UK government to declare a state of emergency, work towards a carbon free economy by 2025 and convene an assembly of ordinary citizens to plan out the country’s carbon-free future. The group’s message has caught on in the wake of increasingly dire reports about the pace of climate change. Organizers had expected a few hundred to show up to the opening salvo near the seat of UK government. Instead, more than a thousand came and decided to block one of London’s busiest intersections for more than two hours. In total, 15 people were arrested Wednesday, then released without charge, but the group says hundreds of members are prepared to go to prison in a series of escalating demonstrations in London next month that will build towards a sit-in in Parliament Square November 17 and occupations of various London bridges. The group read out their Declaration of Rebellion against the government’s lack of adequate action on climate change. The movement has the support of prominent UK activists, academics, politicians and thinkers including Green Party Member of European Parliament Molly Scott Cato, Green Party co-leader Caroline Lucas, former archbishop of Canterbury Rowan Williams and Guardian columnist and environmentalist George Monbiot, who spoke at Wednesday’s protest. The group hopes to inspire people around the world to take similar actions, but feels a responsibility to act in the UK, where the industrial revolution first began. 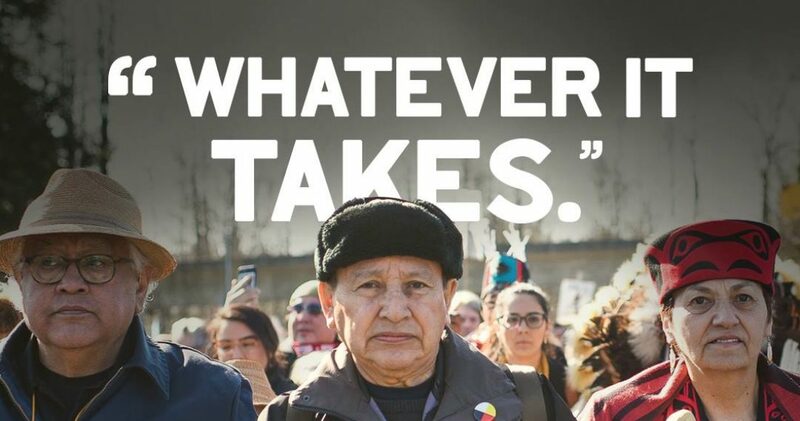 For those who can make it to London the week of November 15, the group has posted a video online called “Heading for Extinction and What to Do About it” and is holding civil disobedience trainings in London November 10 and 11. 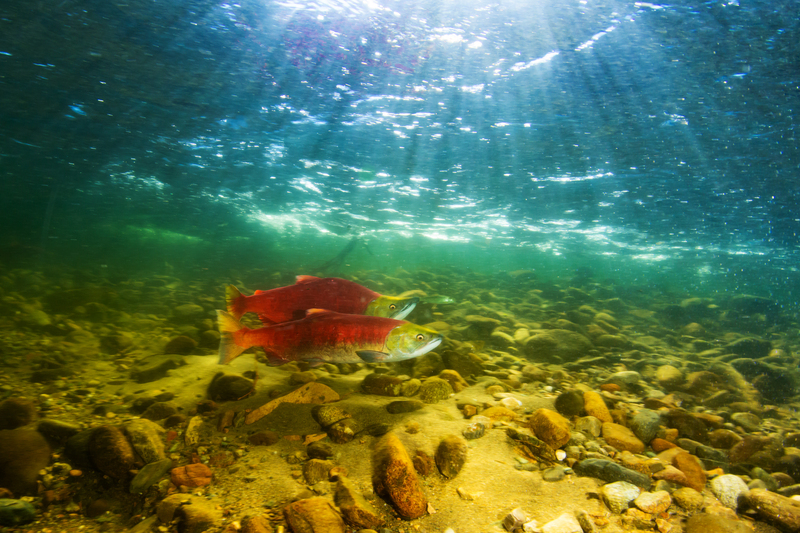 The great spectacle of the salmon run, when red hued salmon swim upstream to spawn in their birthplace in BC rivers, is a sight to behold. And while bears and eagles seem to know where to find the fish, but it can be difficult for us humans to track them down. 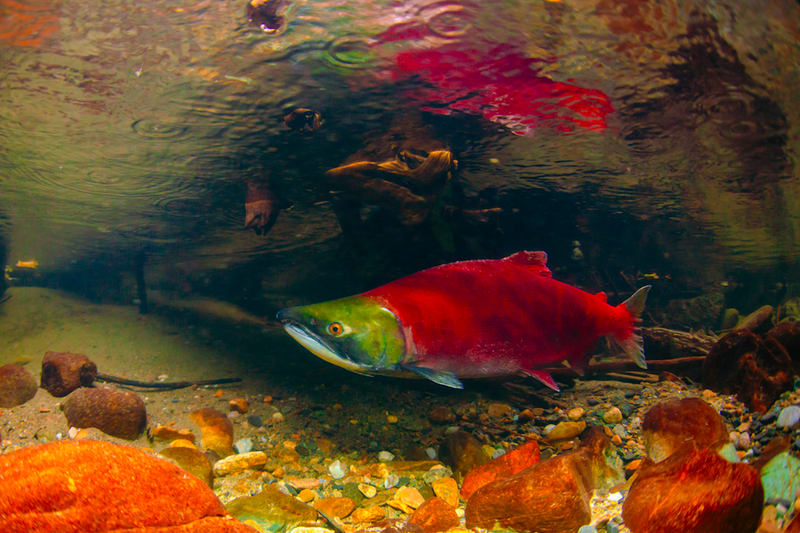 Difficult that is, unless your North Vancouver photographer Fernando Lessa, who documents the salmon run every year, in rivers and creeks all over Metro Vancouver. This year Lessa made his way to the Adams River to capture the annual natural wonder, and shared his photos with Daily Hive. Speaking about how he chose his location, Lessa said the Adams River is a “very important” river and that two million fish were expected this year. It’s rare to get a permit to shoot at this location, he added, “since the photographer/ videographer has to be very careful not to disturb the eggs” or the nesting grounds. 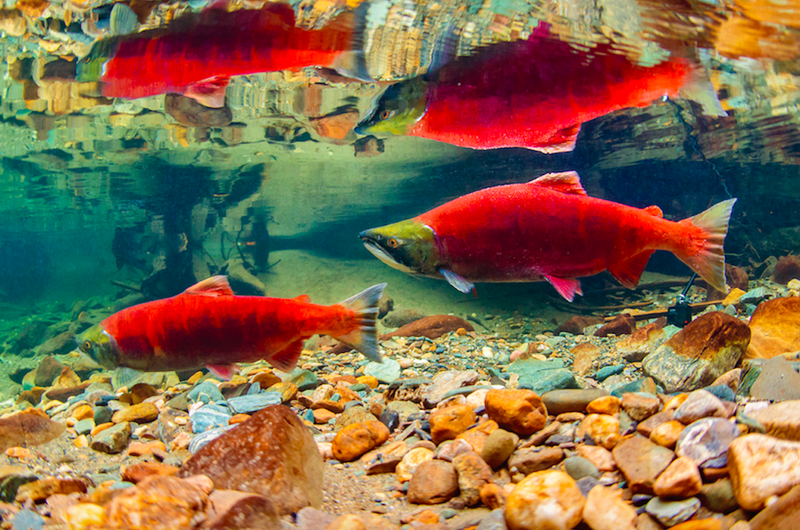 “Once the fish migrate from the Adams lake to the river, they start laying the eggs in the gravel; exposed to predators and to human activity,” Lessa explained. Lesa said that since 2016, he’s been working on what’s known as the Urban Salmon project. This year Lessa said he stayed at the river for seven days at the beginning of October. 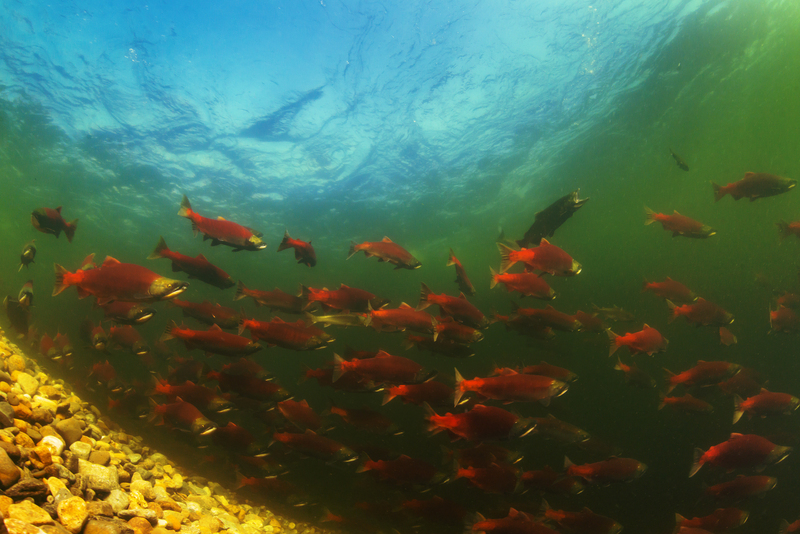 As for the size of this year’s run, Lessa said that while the sockeye run happens every year, this year was especially impressive. 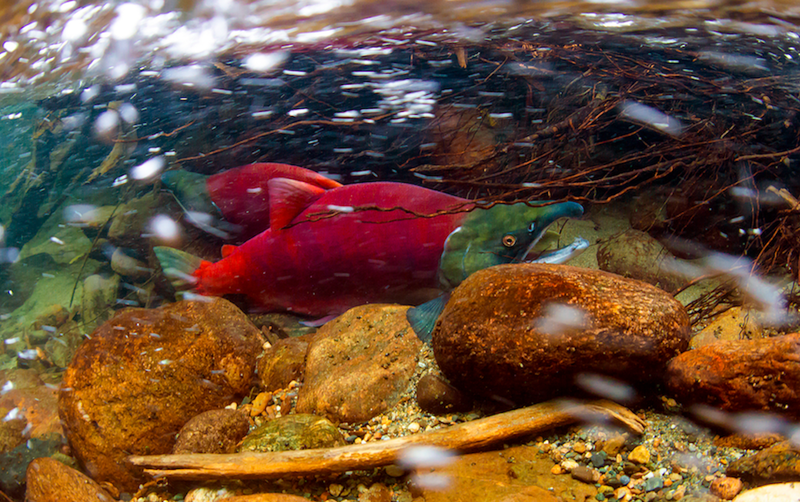 Although he’s done this before, Lessa said this year was his first time with Sockeye in the Adams. Pre-sales of the book are scheduled to start this December, with the book expected to be available in major book stores by February 2019. Reflecting on the project at this point, Lessa thanked those involved with making it happen. 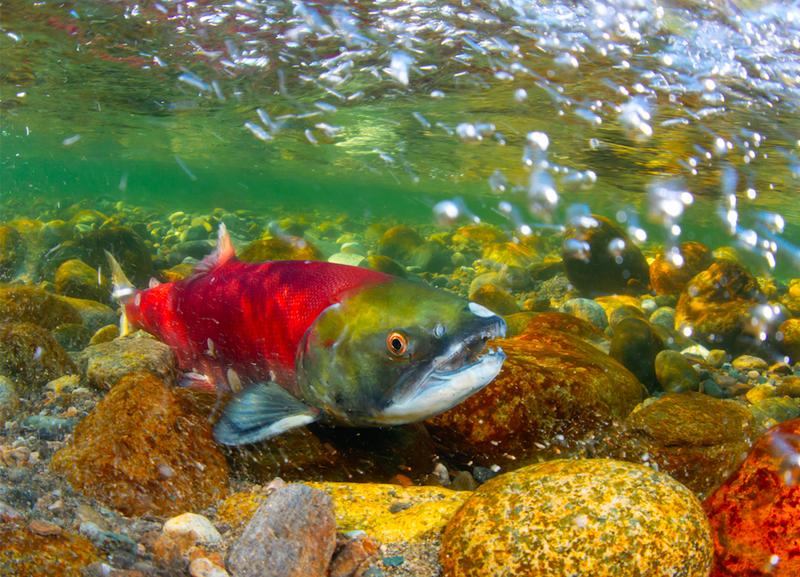 Categories: Current Articles, Wild Salmon | Tags: Salmon | Permalink. Menounos’s team has been charting the glaciers’ retreat for the past decade by measuring ice thickness, using seven-metre poles sunk into the ice. The teams return the following year to measure how much ice has been lost. Uniquely in Western Canada, the Castle Creek glacier also leaves behind elevated ridges or moraines as it retreats each year, giving the researchers striking visible evidence of how quickly the melting is occurring. “We’ve had average [distances between them] of about 14 or 15 metres per year. And the last two years have been 25 to 30 metres each,” says Beedle. What’s happening here at Castle Creek, he says, is the norm for glaciers across Western Canada, especially in southern areas. A giant pocket of warmer than usual water in the Pacific Ocean may be at least partially responsible for the more rapid glacial melt this past summer. Nicknamed “The Blob,” the water is about three degrees warmer than the rest of the Pacific. University of Victoria climate researcher Faron Anslow believes it’s having a dramatic effect on glaciers. “You have all this energy out in the Pacific that’s available to the atmosphere and it blows over those ocean waters and brings those temperatures on land, resulting in a lot of melt,” Anslow says. 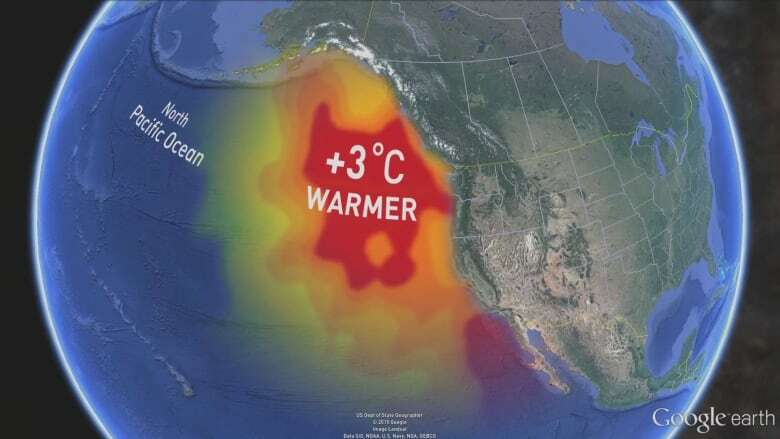 Projections for what B.C.’s climate will look like by 2050 mirror this past summer, he says, thanks to the effects of the warmer Pacific water of The Blob. Menounos, the glacier researcher, says it’s discouraging that much of Western Canada’s 25,000 square kilometres of ice fields won’t last the century. “Most recent work has shown that by and large the glaciers of Western Canada are going to be gone by the end of the century,” says Matt Beedle. Slide the bar to see the change in the Bear Glacier, in northwestern B.C., from 1978 to 2013. Categories: Climate Change/Emergency, Current Articles, Ecology Articles | Tags: climate change | Permalink.